Marriage is about compromise. I indulge my Italian husband by regularly including pasta on our menu plan. He lets me make the kielbasa my German self loves – as long as I don’t make him eat sauerkraut. It works for us. 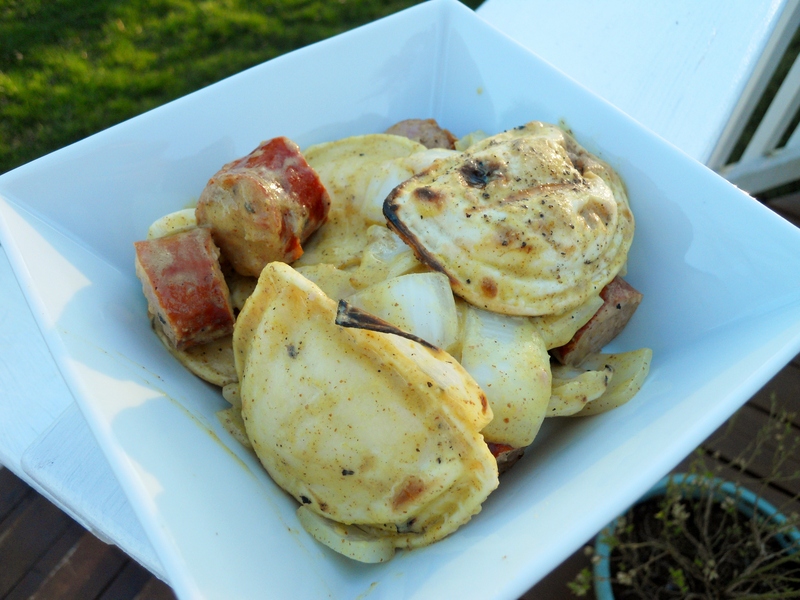 We’ve grilled up pierogies and kielbasa for dinner before, but I’d never topped them with anything. Mostly because I struggle with what to pair it with other than sauerkraut. This vinaigrette was such a simple addition and packed a really big flavor punch. And, it made both Mark and me happy! Grill kielbasa for 4 minutes. Meanwhile, whisk together the mustard and apple cider vinegar. Slowly add 2 tablespoons of extra virgin olive oil while whisking until combined. Set aside. Combine the remainder of the extra virgin olive oil, onion, and pierogies in a large bowl and toss to coat. Flip the kielbasa and add the onion and pierogies, covered, to the grill until the pierogies thaw (about 5 minutes). Turn the pierogies and onion and grill, covered, until everything is cooked through (about 4 minutes). Transfer the pierogies to the bowl. Separate the onion roughly chop. Coin slice the kielbasa. Add both to the bowl containing the kielbasa and pierogies. Pour the mustard vinaigrette in the bowl and toss to coat the kielbasa, pieorgies, and onion. Season with salt and pepper. This was amazing…my husband wants it every week now!